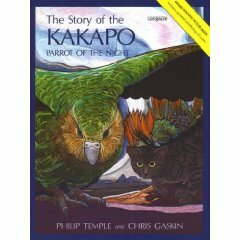 “The Story of Kakapo: Parrot of the Night ” by Phillip Temple and Chris Gaskin ,2000 . Longacre Press. Picture Book. Softcover. Ages 4-8. The kakapo is an endangered flightless bird, found in New Zealand’s forests 700 years ago. The population of these ‘night parrots’ have been drastically reduced by the presence of predator mammals such as cats, that were brought in by European settlers. Conservation efforts have focussed on airlifting these birds from their home range to other islands where they are safe from these predators. This is a story that describes the life of one such kakapo called Kairaki. It is a descriptive piece, where the reader is introduced to the ways of the kakapo – habitat, food, mating, defense mechanisms. Kairaki flees from his home range because a cat has killed his siblings. He roams about until he finds a new home. Here, he survives driving rain, food scarcity and violent gales. During the mating season, he performs the kakapo mating ritual ( this is wonderfully described) and succeeds to mate with only two female kakapo. When the mating season is over, Kairaki wearily returns to his home range where danger still lurks. The writer has skillfully woven the facts about the kakapo into the narrative in an appealing and non-intrusive way. Ornithological notes are provided at the end of the book, and are useful for further research about this bird. The gorgeous paintings , mostly in hues of blue, green and purple, effectively depict the poignancy of the kakapo’s plight and the lushness of its habitat. This book won an AIM children’s book award in 1990.